Sunday October 14, 2018-Bungoma Senator, Moses Wetangula, has dismissed claims that he is planning to deputise Deputy President William Ruto once he vies for presidency in 2022. 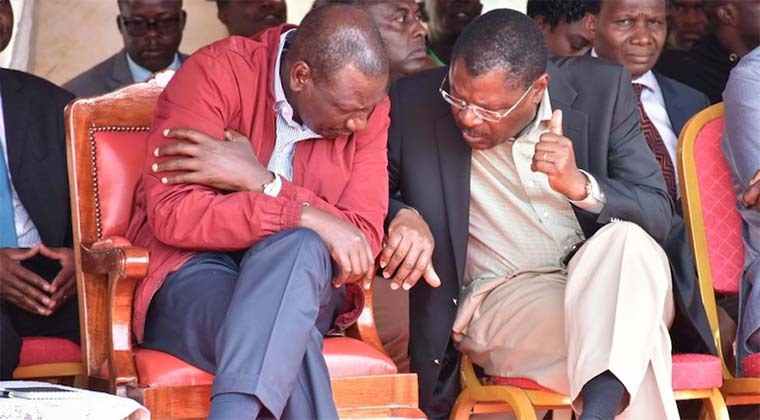 On Friday, a group of Western Kenya leaders asked Wetangula to work with Ruto in 2022 in order to form the government. “We recognise Wetang’ula as a senior politician in this region, we urge him to sit close to the DP,” said Mumias East MP , Ben Washiali insisting that they wanted the Ford-Kenya boss to become the Deputy President and guarantee Western a place in the next government. Kimilli MP , Chris Wamalwa an ally of Wetang’ula, said the region cannot afford to remain in the cold again in 2022, and described Ruto as a good neighbour known by his actions. “’We must plan ahead or else other people would plan for us, Wetang’ula should be Ruto’s deputy,” said Wamalwa. But when he rose to speak Wetang’ula said he was not ready to play second fiddle, saying the leaders asking him to back Ruto must realise that he is a presidential candidate too. “I’m at home and have listened a lot, I’m on a journey and Ford-Kenya has picked me as the party presidential torchbearer,” Wetangula said.